In fine art and photography still life the image objects are traditionally selected, arranged and lit by the artist. We are surrounded by still life groups that just happened to be there and can be equally intriguing. 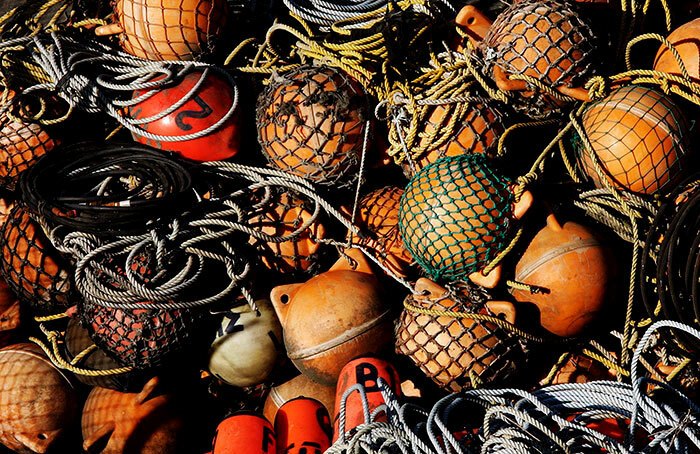 This set of photographs looks at equipment used for sea fishing in coastal waters or the deep sea. Ballard lies to the north of Seattle and a lot of the activity there is sea related: the adjacent monochrome BALLARD WALK FROM BRIDGE WALK records some of those activities. 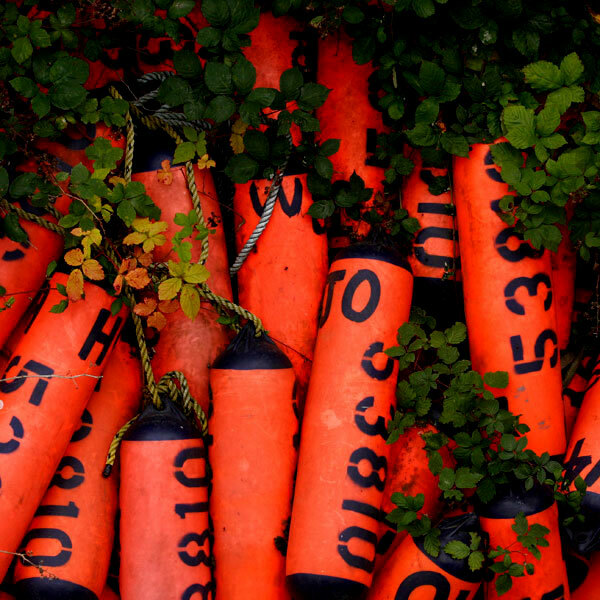 These fluorescent vermillion floats were at the Seattle Fishermen’s Terminal at the Ballard Bridge where approach spans carry the road above the quayside and moored boats. The bridge parapet provided camera support when looking at what was spread out below. Here, a coiled mound of old-bone white floats with peripheral flashes of yellow echoed tight swirls of rapidly moving water. Walking the bridge offered fascinating all-round views of the marine and industrial activities. Progress along its narrow walkways added a nervous edge as traffic passed at speed perhaps a foot away. Meeting and passing another walker was a close encounter; a walking cyclist made for a tighter passing still. Like all the images in this set I used the viewfinder to crop down to concentrate more on details rather than the whole. I liked the horizontal strata of floats, blue plastic wrapping and almost black nets topped by the vertical folds in the top wig of white netting. The few red floats draw the eye and contrast richly with the adjacent blue. It’s not the best composition in the set but does have some appeal. These groups of gear lay in shadow cast by the Ballard bridge approach spans until the afternoon sunlight worked its way to the west. The deeply layered swirls of rope created their own internal shadowing. I centred the fading blues of the central coil set against the lower layers where the same colour had been almost obliterated by use and weathering. In new rope and bright sunlight such blue is strong and bright. In autumn travels in rural areas around Seattle it’s difficult not to encounter at least one roadside stall displaying gourds, pumpkins and all manner of seasonal fruits and vegetables. Gourds seem infinitely variable in the forms, surfaces textures and colours which make their larger pumpkin relatives seem sober. I associate this and the other images of netted globular floats and their variations on orange and green colours with those displays. Looking across other galleries it’s obvious that I like to group together variations on a single subject. Much of my photography is only lightly planned and often much of the interest comes from responses to the unexpected whilst out walking. To me, similar images recall the memories of what I saw before me at that time. So, this is another framing of nets and floats concentrating largely on orange with a small network of green. The vertical chain-like linked rope was something I couldn’t recall seeing before. The drum of fine rope suggests a large scale rod fishing reel: perhaps it serves a similar function on board a fishing vessel. 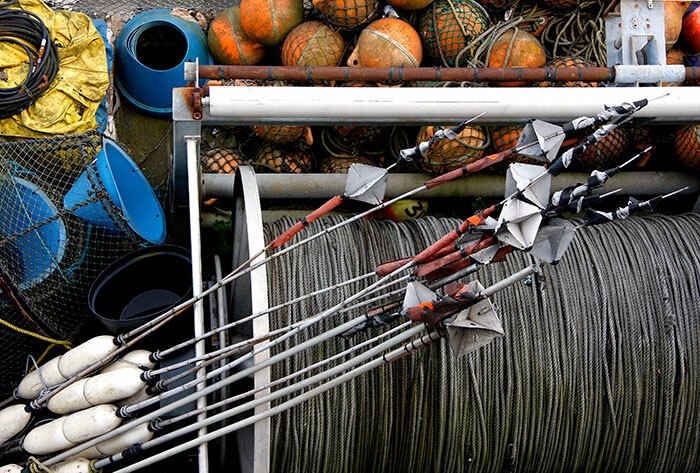 The white floats carry metal radar reflectors and seemingly furled pennants for marking the positions of cast gear. 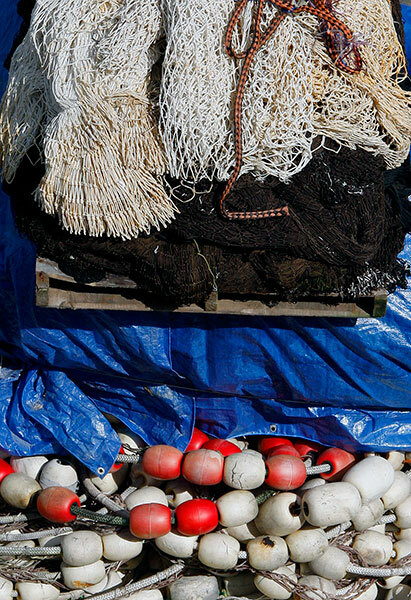 The blue cones seem to be part of another variation on the lobster pot designs illustrated in later images. The rotated ‘L’ section in the composition is a device I like to use when it occurs. These stacked baskets were formed from knotted black fibre netting stretched taught across welded steel frames. Numerous stacks of these conical plant pot forms stood packed together amongst a great variety of larger nautical and sea fishing equipment. I assume that they are used to transfer fish from boat to shore just as at home where slatted wooden boxes have been replaced by white and brightly coloured plastic. 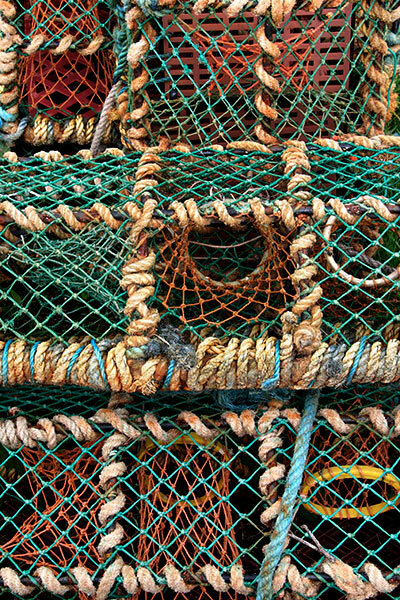 Closer to home these nets and ropes were on the North Shields Fish Quay at the mouth of the River Tyne. The blue colour of the ropes only survives as a spiral running between its several strands. The lavender blue toned netting contrast with the shrill orange-reds elsewhere in the composition. 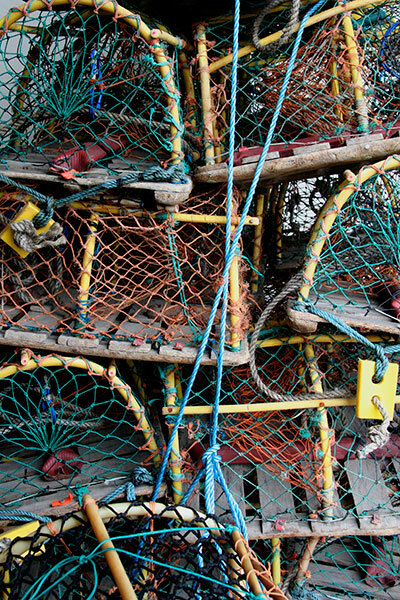 These neatly stacked steel framed lobster pots were also on the North Shields Fish Quay. 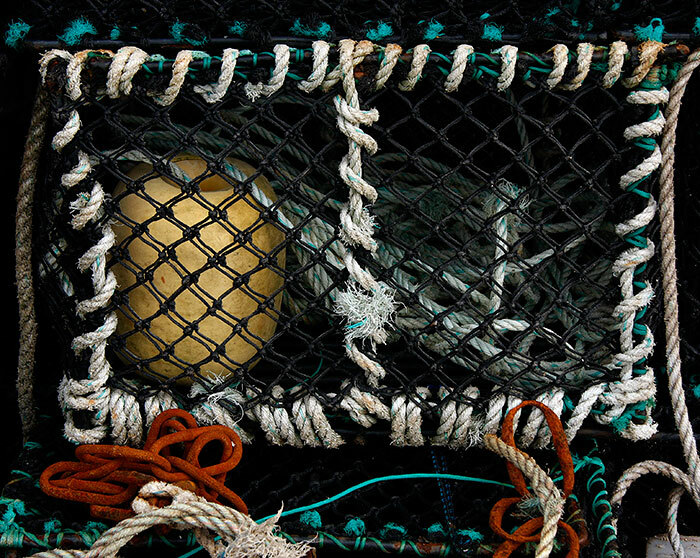 They’re baited and set offshore under marker buoys to catch crab and lobster. For a short distance trains on the east coast rail line from London to Edinburgh run on the edge of high North Sea Cliffs north of the Scottish Border. On a recent evening return journey south the sun glinted on the very numerous markers close inshore. I speculated on the skill and memory needed in servicing all the pots resting on the seabed below. These pots have had many immersions in the sea off Tynemouth and beyond. They hark back to past construction using wood slats for the floor anchoring the curved net supports. At the time, I didn’t look closely at the flexible yellow rods used but in the photograph they look like red cored plastic roughened through use. Weights to sink them are fixed to the floor. Blyth and its port prospered through coal exports, shipbuilding, commercial shipping and fishing: the first two ceased after the 1980s. Part of the harbour is now a marina and commercial shipping continues to use its quays. It was one of the visiting points in the 2016 Tall Ships Race. 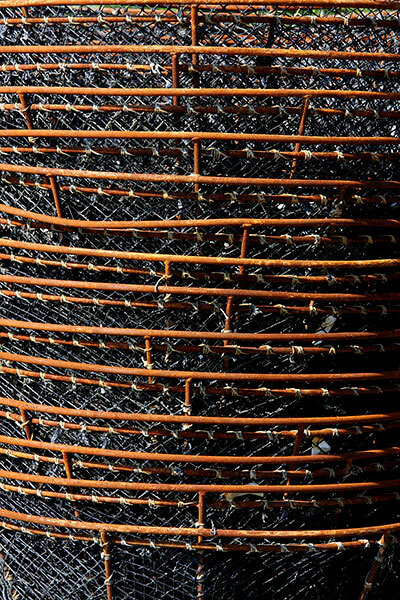 This stack of seemingly new pots show the interior tapering funnels that allow crustacean access to the bait but prevent their escape back to the sea. These robustly handmade pots from Northumberland are unusual in form when set against the familiar arched designs shown on other images. Their sturdy and compact construction perhaps relates to the local rocky seabed and the often rough seas into which they are dropped. Tobermory is a picturesque town on the Isle of Mull. Its open harbour curves between two headlands with a quayside road backed by often brightly painted buildings. Its single projecting pier offers moorings and space for fishing gear. 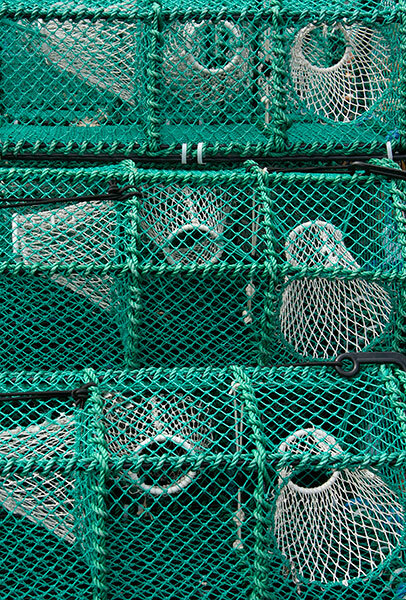 The blue ropes binding some of these lobster pots belie the impression that this is a monochrome image. 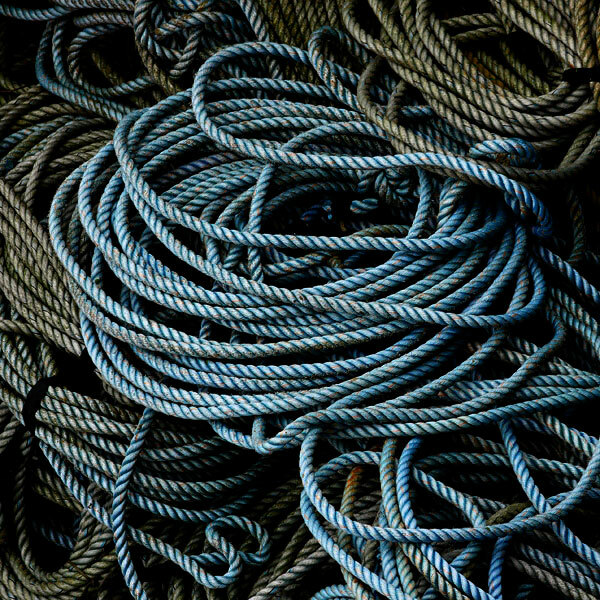 With their intricate mass of handling ropes swirling on the stone slabbed quayside they were set in a long stack against the pier’s protective rear wall. One problem with a closely cropped composition is that the subject’s identity can sometimes become unclear. 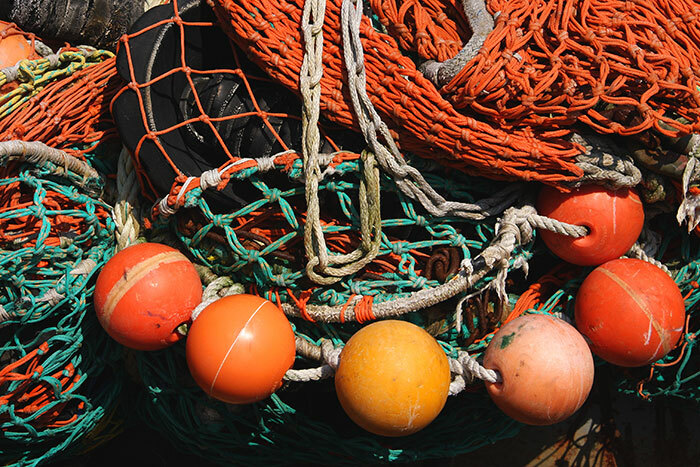 This looks like a framed lobster pot containing a yellow float and lengths of rope but perhaps not. I was primarily interested in the shapes, textures and colours of the materials, the turquoise blue framing and the deep red flashes of the rusting chain. 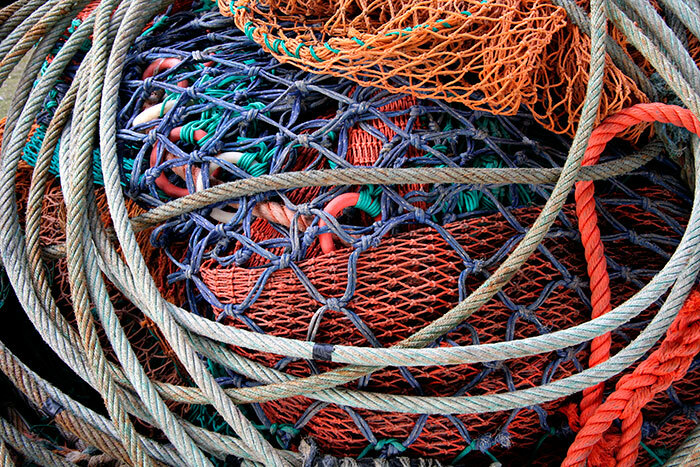 This is a detail from a large block of tightly packed netting stacked with others along the quay. 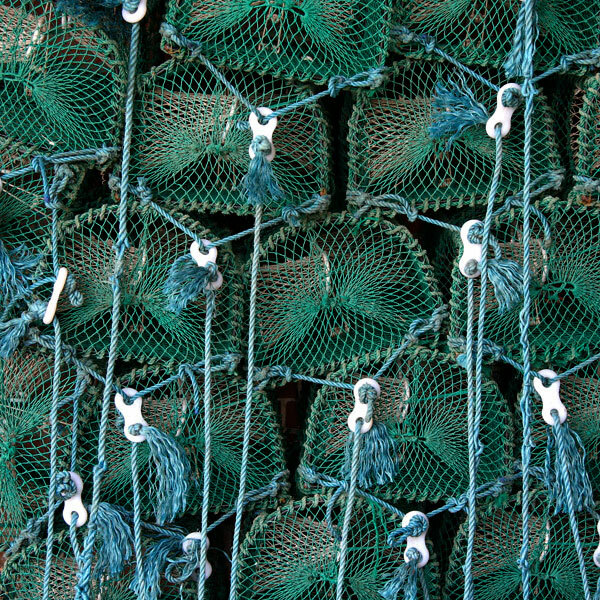 I was attracted to the colour and the knotting of the cord in these single and double strand nets. The ropes seemed to hold them together like a parcel. Writing these notes reminds me of Joan Eardley’s painting of the net drying green at Catterline, a small and rugged village on the coast south of Aberdeen. 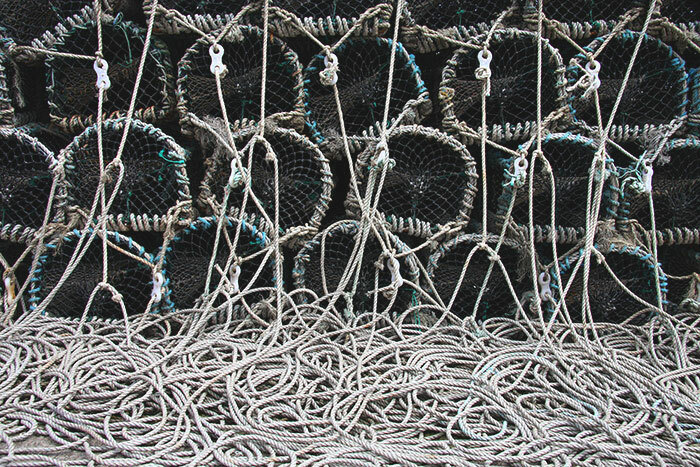 The lobster pots in Image 15 are set to dry out but where do the Tobermory fishermen dry and repair their nets? 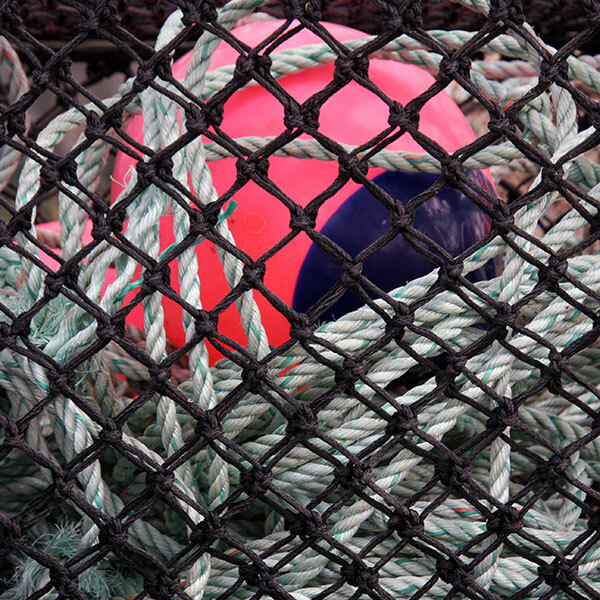 Like the structure of Image 15, I was drawn to this composition framing the layering of netting, ropes and the pink eyeball float they fronted. 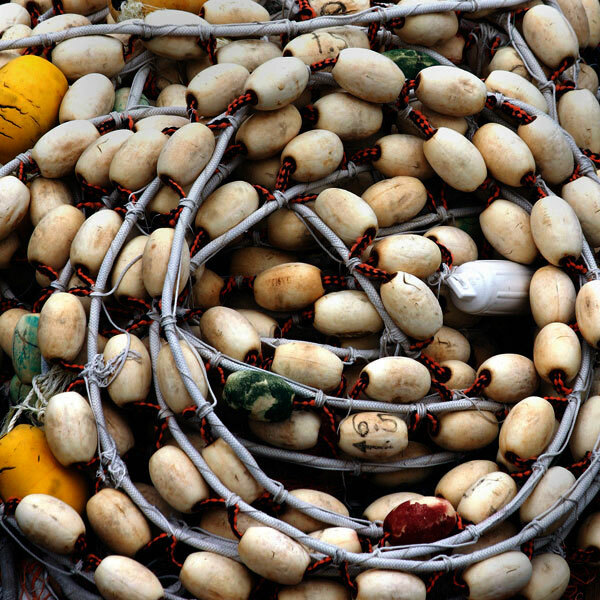 The white rope has a sharp blue strand wound into it, giving flashes of colour along its length. 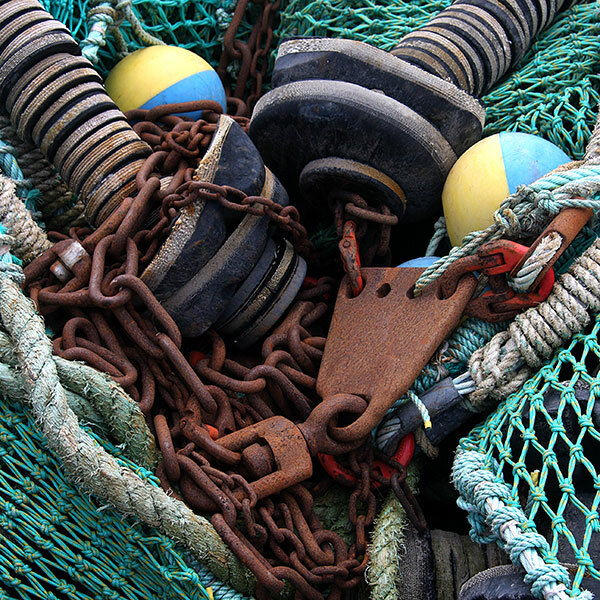 At the end of the pier there was a large mound of nets on to which these metal chains, fittings, ropes and floats had been dropped. 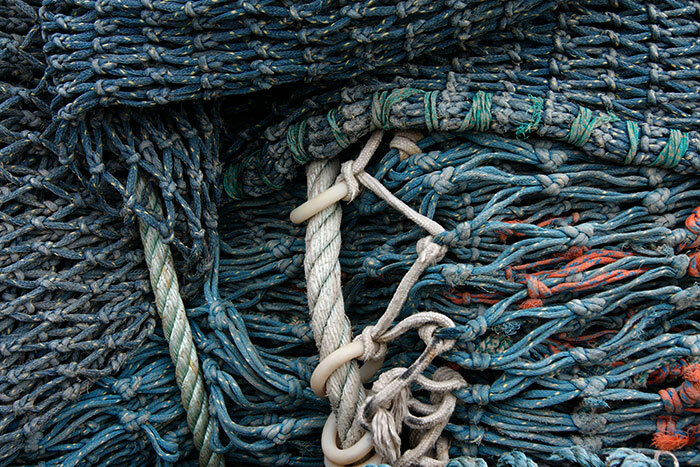 The sharper and brighter blue-green of the netting contrasts with the softer tones in Image 16. I like visiting Scotland’s Western Isles very much and look forward to my next journey to explore by foot, train, ferry and bus. I may have to add a car rental from Inverness to take me across to Stornoway and around the Isle of Lewis in the far west.